The Presidential season is well underway with a dozen announced or declared candidates, including the entry of a fifth woman into the race Sunday, marking an historic number of women running for President. In 2016, Hillary Clinton was the first, and only, woman ever to become a major-party nominee for president. Minnesota's Senior US Senator, Amy Klobuchar, announced her 2020 presidential campaign Sunday afternoon at a rally in her home state of Minnesota. 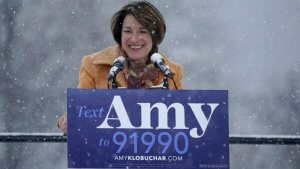 "I stand before you as the granddaughter of an iron ore miner, the daughter of a teacher and a newspaperman, the first woman elected to the United States Senate from the state of Minnesota, to announce my candidacy for president of the United States," Klobuchar declared to supporters in 19 degree weather. Traditionally presidential contenders open an exploratory committee and declare their intention to run, then follow within a month or so with a formal announcement and event to maximize extended media coverage. With a 24/7 media-driven electorate and daily coverage, however, some of the candidates, like Klobuchar, have opted for one main event. 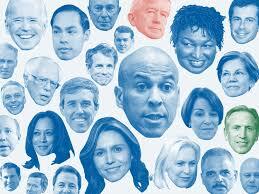 As anticipated, the field of Democratic hopefuls has narrowed, as potential candidates weigh the merits of running in the current environment and how to distinguish themselves amongst the current field. With the entrance of just one or two other major contenders, the political dynamics could shift dramatically. Any serious contender is likely to jump in by the end of March. Elected in 2006, Booker is the first African-American to represent the Garden State in the US Senate. A long-rising Democratic star, he drew national attention as Mayor of Newark when he raised millions to revitalize the city. Booker, 49, is a vocal presence on the Senate Judiciary Committee. An articulate Trump critic, he sponsored the Special Counsel Independence and Integrity Act to limit the executive powers of the President. Undergrad and Masters Stanford University, Rhodes Scholar/Oxford, JD: Yale Law School. 1/23/19 Buttigieg, 37, announced saying the 2020 election should be focused on "inter-generational justice." Elected Mayor in 2011 with 74% of the vote, he was the youngest mayor of a US city with at least 100,000 residents. While in office, Buttigieg deployed for seven months to Afghanistan, then won re-election with 80%. Buttigieg's star rose within the Democratic party as a candidate for DNC Chair in 2017 and, if successful, would be our country's first openly gay president. Undergrad: Harvard, Rhodes Scholar/ Oxford, Lieutenant in the Naval Reserve. 1/12/19 Castro, 44, whose grandmother immigrated to the US from Mexico as a child, became a rising star as mayor of San Antonio (2009-2014). He drew national attention as the first Hispanic to deliver the keynote at a Democratic Convention in 2012, and was on Hillary Clinton's shortlist for VP in 2016. He is the only Latino candidate and among the youngest in the field. 7/28/17 The three-term Congressman from Maryland officially declared his presidential candidacy in July of 2017. The 55 year-old, self-made millionaire and entrepreneur, who amassed his fortune in the banking and finance industry, has since visited all 99 counties in Ohio and all ten in New Hampshire. He has a 30+ staff operation and has racked up over 320 campaign stops. Gabbard, 37, who was first elected to the US House in 2012, is the first Hindu and the first American Samoan elected to Congress. In 2002, at age 21, Gabbard became the Hawaii's youngest legislator ever elected and the youngest woman ever elected to a US state legislature. She was twice deployed to the Middle East as part serve in the Army National Guard. Her conservative votes in the legislature on gay marriage have attracted great criticism, but Gabbard defends her now progressive populist credentials -- and was one of Bernie Sanders' earliest supporters. Undergrad: Hawaii Pacific University, Major in the Hawaii Army National Guard. Announced: Elected to the US Congress in 2006 as the Representative from Albany, Gillibrand was appointed to the Senate in 2009 to succeed Hillary Clinton, won the 2010 special election to fulfill the remainder of Clinton's term, and was re-elected in 2012, and in 2018 with 67% of the vote. Gillibrand, 52, has established herself as an ardent Trump foe, and a leading voice in the anti-sexual harrassment and #MeToo Movements via and early efforts to uncover sexual assault in the military. Her criticism of former President Bill Clinton's actions in office and 2017 call for fellow Democratic Senator Al Franken (MN) to resign over sexual misconduct allegations has alienated some party faithful. Undergrad: Dartmouth College, JD: UCLA School of Law. Harris, 54, was elected in 2016 to succeed retiring Senator Barbara Boxer, becoming the first minority woman elected to the US Senate from the California. Harris is a visible member of the Senate Judiciary Committee and emphasizes her background as a prosecutor and defender of the people. The daughter of immigrants, she is first US Senator of Jamaican and Indian descent. Harris previously served as the State Attorney General (2011-2017), and as San Francisco District Attorney (2004-2010). She launched with a full campaign operation and senior staff, with her HQ in Baltimore, Maryland, and a second office in Oakland. Undergrad: Howard University, JD: University of California, Hastings College of the Law. Announced: 2/10/19 Klobuchar, 58, was reelected last month by a 24-point spread in the heart of the Midwest -- crucial to a 2020 victory. Although she starts with less name recognition, her pragmatic, centrist approach is appealing to moderate voters and her self-described "grit" has been well received on the road. A member of the Minnesota Democratic-Farmer-Labor Party, when elected to the Senate in 2006, Klobuchar became the first female US Senator from the state. Declared: 1/27/19 Following his retirement last June as Chair of Starbucks, Howard Schultz wrote a book, hired a PR team that includes both McCain and Obama advisors, and, last month, on 60 Minutes, rolled out his presidential aspirations -- as an independent. As a non-politician worth an estimated $2.6 billion he could be a formidable force --but the backlash to his announcement may have buried his candidacy before its start. Schultz's on-air declaration was met with backlash for its lack of message and potential to divide Democratic votes and boost a second-term for Donald Trump. Announced: 2/9/19 Warren, 68, has long been a superstar in the national progressive community, with the online following to prove it. A proven fighter and formidable Trump foe, she came out swinging strong with public policy stances and written initiatives, including "a millionaire's tax." The former law professor, author and consumer advocate has a high national profile, but one with some early missteps on the national stage regarding her Native American heritage. Warren started with the most sophisticated campaign operation, with 50+ on the payroll and a nationwide list of supporters. Author and Speaker Marianne Williamson, 66, and California entrepreneur Andy Yang, 44, are also announced candidates. Who Is Not In Yet? Former US Vice President and US Senator Joe Biden (DE), Senator Michael Bloomberg, former NYC Mayor and founder/CEO of Bloomberg LP, US Senator Sherrod Brown (OH), former Governor Terry McAuliffe (VA), former Congressman and Texas Senate candidate Beto O'Rourke and US Senator Bernie Sanders (VT). Other names in play: US Senators Michael Bennet (CO) and Jeff Merkley (OR), Governors Steve Bullock (MT), John Hickenlooper (CO) and Jay Inslee (WA), and former US Attorney General Eric Holder. Former West Virginia State Senator Richard Ojeda has dropped out of the race. A Monmouth University Poll, conducted January 25-27, 2019 of registered voters nationwide who are Democrats or lean Democratic (Margin of error ± 5.5), asked respondents,"I know the 2020 election is far away, but who would you support for the Democratic nomination for president if the candidates were the following?" Options rotated. Results include leaners. Among the 20 candidates cited in the poll, Joe Biden led with 29%, followed by Bernie Sanders (16%), Kamala Harris (11%), Elizabeth Warren (8%), Beto O'Rourke (7%), Mike Bloomberg (4%), Cory Booker (4%), Amy Klobuchar (2%), Sherrod Brown (1%), Julian Castro (1%), Tulsi Gabbard (1%), Kirsten Gillibrand (1%), John Hickenlooper (1%), Eric Holder (1%) and Andrew Yang (1%), Other (1%), No One (3%) and Unsure (9%). John Delaney, Jay Inslee, Terry McAuliffe and Pete Buttigieg were also listed. Last Friday the world celebrated the life of boxing legend, great athlete and even better man – Muhammad Ali. While tonight’s New Hampshire primary is just the second contest in the four-month nomination race, it is an important benchmark in narrowing the candidate field.